While surfing the internet today, the below online news caught my attention. I wonder if there are more of these notes circulating around in Jurong? 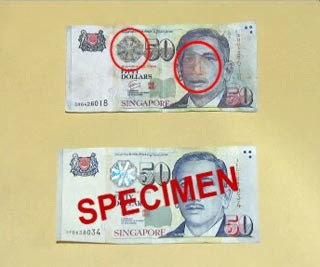 SINGAPORE: Over the past four days, six hawkers at the Market and Food Centre at blocks 221, 221A and 221B in Boon Lay Place each received a fake 50—dollar note. It’s not hard to tell the difference between the fake and real notes. The print on the fake notes smudges after coming into contact with water. But it’s easy to miss out these details despite the tell—tale signs. That was why the six hawkers, who sell drinks, food and vegetables, suffered losses of S$300. The victims said the culprits act alone and turn up when the stall owners are busy. Now, the hawkers have become more alert, and have also warned others to be careful. Police said they received 72 such reports from 2006 till the first half of last year.